Pitch your WordPress development services to potential clients with an expert proposal that highlights your eye for design. 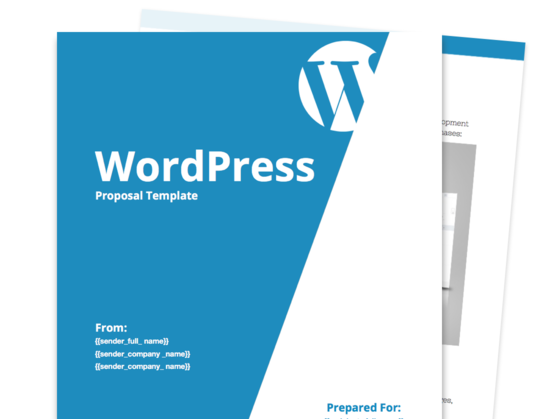 Our WordPress proposal template will help you detail your experience in web design and the services you can offer. The template offers sections for the process, pricing, deliverables, and more. Professionally introduce your company’s services using a well-thought-out WordPress proposal template that you can customize according to your requirements. Highlight your expertise in designing fully functional websites with a WordPress feature that lets you post blog articles and manage content easily. Present your project specifics and expected deliverables in a way that can be easily understood by your prospects. Create a straightforward pricing list that details the individual elements of your web design engagement and their associated costs. Web design agencies and freelancers that specialize in creating websites that use the WordPress content management system (CMS) and plugin architecture. Your proposal to any prospective client should be prefaced by an introductory section that highlights your experience and proficiency in creating WordPress-powered websites. Here, you can talk about your firm’s history in the web development industry, in addition to showcasing your people’s creative and technical capabilities. Web design—even that which takes advantage of an open-source CMS like WordPress—can encompass different skills, disciplines, tools, and methodologies. These include web graphic design, interface design, authoring, user experience design, and search engine optimization. As such, it is important for your proposal to have a section that will give your clients an idea about the scope of your competencies. 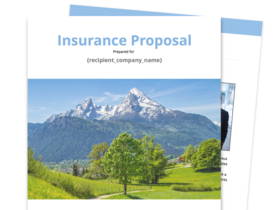 This section of your proposal will outline all the deliverables that you need to deliver between the initial planning stage up to the final deployment of the finished website. This part of your proposal identifies and describes the distinct phases in which the proposed web development process will take place. These stages can include the following: planning, concept design, coding for the primary and secondary pages, website review and testing, and project completion. This section describes the framework of the web development process and the steps that you will follow as the web developer. The summary can cover the different stages of the process, including the analysis, design, development, and deployment phases. You owe it to your client to provide them a transparent and easy-to-understand list of prices that details the costs of your services. In this section, you can outline the fees associated with services like WordPress custom design, web hosting, and plugin acquisition, among others. Confirm your company’s and your client’s obligations with a comprehensive Terms and Agreement section. This will serve as an initial contract between your organizations. Much like real estate, Property Management requires a high level of detail and professionalism. 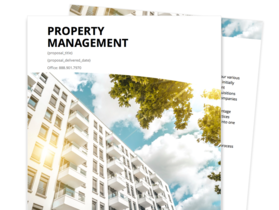 With this Property Management Proposal template, you'll stand out from the competition. 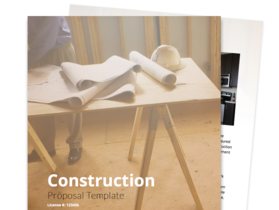 This Construction Proposal template will help you get up and running quickly by including important sections win the next bid. Whether you do commercial or residential construction, this is the perfect template to both impress your client and quickly close the deal.